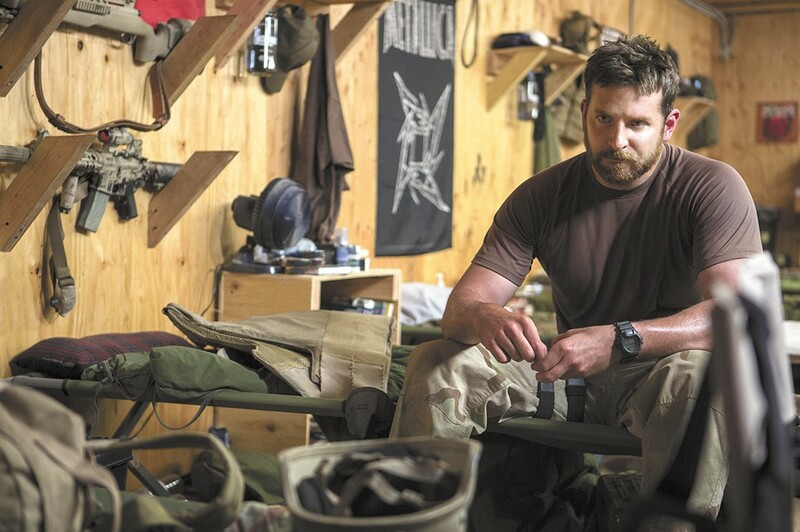 Bradley Cooper turns in one of his best performances to date as real-life sniper Chris Kyle. If movie-world think pieces are any indication, American Sniper is the latest fact-based movie that simply isn't going to be allowed to be a movie. We're apparently not allowed to talk about it without worrying about whether it smoothes over the rough edges of its primary subject, Navy SEAL Chief Chris Kyle, or speculating on its politics because of what we know about director Clint Eastwood and his conversations with empty chairs. It's not possible for me to stress this enough: If you are looking for a review of the documentary that American Sniper isn't, I invite you to search elsewhere; good luck and godspeed. None of which is to say that what is on the screen isn't occasionally frustrating, or disappointing, or simplistic. But it's also startlingly good at one particular thing: looking inside the head of a soldier who can't process his wartime experience because he doesn't know how to look inside his own head. And it's a fantastic showcase for Bradley Cooper playing the kind of character it's not always easy for an actor to capture. American Sniper opens with Cooper's Chris Kyle on his first tour in Fallujah, perched on a rooftop protecting the Marines clearing buildings door-to-door. From the moment of his first life-or-death decision, the story flashes back — to his Texas childhood, his career as a rodeo cowboy, his eventual enlistment, and his courtship and marriage to his wife, Taya (Sienna Miller) — before returning to his experiences serving in Iraq. But between those tours, he finds himself unable to return to normalcy in his family life. Plenty of American Sniper is spent on Chris' battlefield exploits and traumas, from the expertise as a marksman that earned him the nickname "The Legend" to the death of fellow soldiers he was unable to save. Eastwood brings tension to plenty of those life-or-death set pieces, including a harrowing section where an Iraqi informant for the U.S. troops faces a barbaric enforcer. Yet it's also hard to ignore that the film's perspective often turns it into a straightforward action movie unconcerned with moral complexity, especially when Chris' counterpart in the Iraqi insurgents — an Olympic marksman named Mustafa (Sammy Sheik) — practically becomes a James Bond supervillain in his seeming invincibility. Virtually all the time that American Sniper is on the field of battle, it feels indistinguishable from any patriotic, troop-supporting tale you could name. When Chris has to stare down the aftermath during quiet moments, it's an entirely different story. Eastwood and screenwriter Jason Hall struggle with how to incorporate Taya into Chris' unsettled world — sometimes finding the convincing terror of a phone call home that's interrupted by a sniper attack, sometimes making her the whiny wife who says things like "It's not about them, it's about us" or "Even when you're here, you're not here." Yet American Sniper is terrific at conveying Chris' inability to leave Iraq behind, whether it's his nervous reactions to sounds like a lawnmower starting, or his awkwardness in knowing how to respond when he's greeted by a soldier whose life he saved. As a portrait of post-traumatic stress that never allows the end of the war truly to be the end of the war, it's remarkably potent. Much of the credit for that portrait goes to Cooper, in a performance that's engrossing in its taciturn simplicity. As portrayed in American Sniper, Chris doesn't overthink his job of killing the people who threaten his comrades in arms, which makes him both very good at what he does and very bad at knowing how to live when he's no longer doing it. He's a God-fearing patriot, and neither Eastwood nor Cooper ever put that context in ironic quotation marks; they make Chris' lack of introspection both intriguing and heartbreaking. American Sniper and American Sniper: The IMAX Experience are not showing in any theaters in the area.